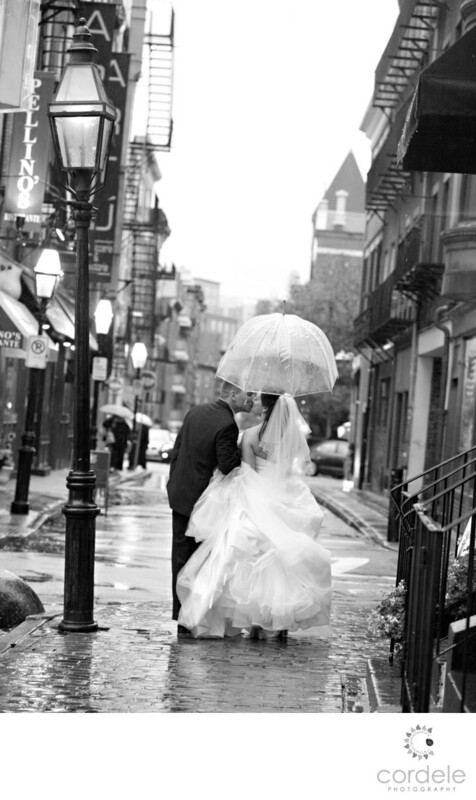 The rain could not dampen wedding photos being taken in the North End of Boston. When working in the rain in the North End its important to keep in mind that awnings are your friend. Not even the rain could keep Jess and Joe from getting photos out of a movie! Their wedding day was well, wet. They got the MOST amazing photos though because they were willing to go out and get the photos. Jessica didn't even worry about her dress getting wet. Their guests were nice enough to hold umbrellas over me and my second shooter so we could get the photos we wanted. After this shot we went back and had them hid in an alley of sorts to let them try and stay dry. Then we would have them come back out into the street when traffic had cleared. The neighborhood people were so willing to move out of our way, or help the bride and groom anyway they could. In this photo over to the left, the couple who owns the apartment to the right was standing there patiently waiting and waiting and waiting for us to be done. I didn't see them because I was busy shooting focused on the couple. I finally looked up and they were standing there SOAKING wet, and I said "Oh my gosh, is that your apartment!?" and they smiled. I said "GO GO GO!!" and then they rain inside, soaking wet. People of the North End are so accommodating that it made for such a nice day. I always tell people, it's what you put into the photos that make a difference in what they look like. The North End is located north of Boston, and is on the harbor. There are so many fabulous places totake photo and eat! Our favorite place to go is the Hanover street area and the Salem Street. While Mike's Pastries is a great pastry shop, you can't miss out on Parziale Bakery which is owned and operated by my brother in laws family.